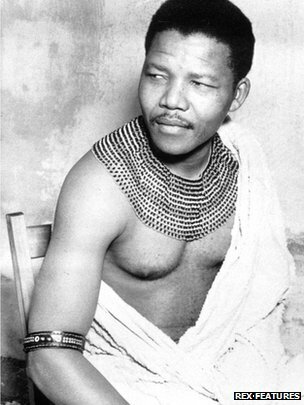 Nelson Mandela was a figure of international renown, and many details of his life and career were public knowledge. But here are six things you may not have known about the late South African leader. 1. He was a boxing fan. 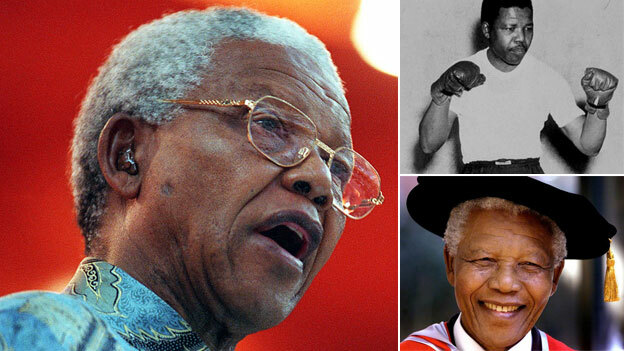 In his youth, Nelson Mandela enjoyed boxing and long-distance running. Even during the 27 years he spent in prison, he would exercise every morning. “I did not enjoy the violence of boxing so much as the science of it. I was intrigued by how one moved one’s body to protect oneself, how one used a strategy both to attack and retreat, how one paced oneself over a match,” he wrote in his autobiography Long Walk to Freedom. “Boxing is egalitarian. In the ring, rank, age, colour and wealth are irrelevant… I never did any real fighting after I entered politics. My main interest was in training; I found the rigorous exercise to be an excellent outlet for tension and stress. After a strenuous workout, I felt both mentally and physically lighter,” he wrote. Among the memorabilia in the Mandela Family Museum in Soweto, visitors can find the world championship belt given to Mandela by American boxer Sugar Ray Leonard. 2. His original name was not Nelson. Rolihlahla Mandela was nine years old when a teacher at the primary Methodist school where he was studying in Qunu, South Africa, gave him an English name – Nelson – in accordance with the custom to give all school children Christian names. Rolihlahla is not a common name in South Africa. It is Xhosa, one of the 11 official languages in the country, spoken by about 18% of the population. It literally means “pulling the branch of a tree”, but its colloquial meaning is “troublemaker”. His circumcision name was Dalibunga, meaning “founder of the Bunga”, the traditional ruling body of the Transkei – the rural area where he was born. “To Xhosa traditionalists, this name is more acceptable than either of my two previous given names,” he wrote in his autobiography. However, in South Africa, Mr Mandela was often called by his clan name – Madiba – which South Africans used out of respect. 3. He was on a US terror watch list until 2008. 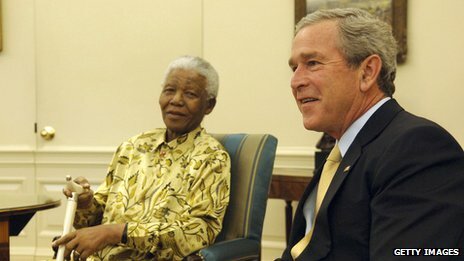 Prior to that, along with other former ANC leaders, Mr Mandela was only able to visit the US with special permission from the secretary of state, because the ANC had been designated a terrorist organisation by South Africa’s former apartheid government. “It is frankly a rather embarrassing matter that I still have to waive in my own counterparts – the foreign minister of South Africa, not to mention the great leader, Nelson Mandela,” then-Secretary of State Condoleezza Rice said in 2008. The bill scrapping the designation was introduced by Howard Berman, chairman of the House Committee on Foreign Affairs, who promised to “wipe away” the “indignity”. Ronald Reagan originally placed the ANC on the list in the 1980s. 4. He forgot his glasses when he was released from prison. 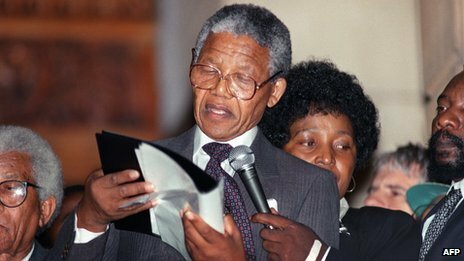 Mr Mandela’s release on 11 February 1990 followed years of political pressure against apartheid. On the day, he was “astounded and a little bit alarmed”, he recalled later. Mr Mandela and his then-wife Winnie were taken to the centre of Cape Town to address a huge and euphoric crowd. But when he pulled out the text of his speech, he realised he had forgotten his glasses and had to borrow Winnie’s. 5. He dressed up as a chauffeur to evade police. After going underground because of his ANC activities, Mr Mandela’s ability to evade the securities services earned him the nickname “the black Pimpernel”, after the novel The Scarlet Pimpernel, about a hero with a secret identity. PHOTO: NELSON MANDELA WAS NOT ONLY SENTENCED TO LIFE IMPRISONMENT IN 1964, BUT LIFE WITH HARD LABOUR. THIS IS HOW HE SPENT MOST OF THE 27 YEARS ON ROBBEN ISLAND –BREAKING STONE ON A QUARRY. THE WHITE LIMESTONE REFLECTED THE SUN’S RAYS SO SHARPLY THAT MANDELA SUFFERED PERMANENT EYE DAMAGE. 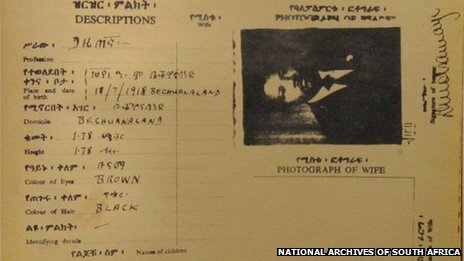 Mr Mandela is known to have disguised himself as a chauffeur, a gardener and a chef in order to travel around the country unnoticed by the authorities. Nobody seems to know how Mr Mandela, who had been operating underground with a false identity, was ultimately exposed and arrested. 6. He had his own law firm, but it took him years to get a law degree. 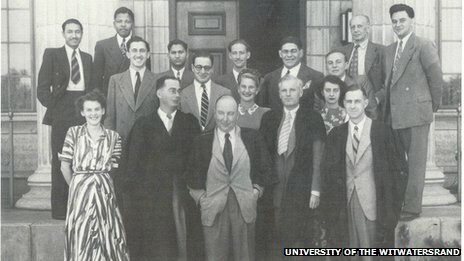 Mr Mandela studied law on and off for 50 years from 1939, failing about half the courses he took. A two-year diploma in law on top of his university degree allowed him to practise, and in August 1952, he and Oliver Tambo established South Africa’s first black law firm, Mandela and Tambo, in Johannesburg. He persevered to finally secure a law degree while in prison in 1989. Latest updates from official memorial service in Johannesburg. What is his economic legacy?